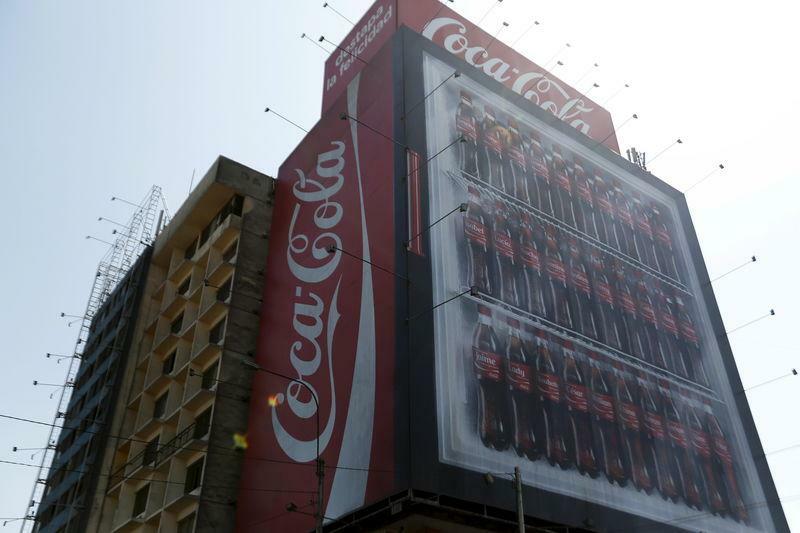 (Reuters) - Coca-Cola Co (KO.N) on Wednesday reported better than expected profit and revenue, helped by price increases in North America, as the beverage maker struggles to grow amid sluggish demand for soda. The world's largest beverage maker showed the first revenue rise in nine quarters and shares gained 1.3 percent to $41.30 in midday trading. U.S. sales of carbonated soft drinks have been declining for nearly a decade, with consumers shifting away from diet soda because of health concerns. Global Diet Coke sales volumes were down in the quarter, while Coke Zero, Sprite and other brands showed growth. Coke has called 2015 a transition year as it attempts to figure out how to increase soda sales. It kept its 2015 forecast unchanged Wednesday and said it will spend up to $3 billion this year buying back stock. "Investors will need patience here, but get paid a healthy dividend while they wait for better times," Jack Russo, an analyst at Edward Jones, said in an email. The company has said it is targeting $3 billion in annual cost savings by 2019 and plans to reinvest part of that in marketing. The company has said it will hand back, or refranchise, about two-thirds of its North American bottling territories by the end of 2017. With new agreements to give seven U.S. bottlers greater control of operations, Coke said it was on track to meet those goals. "We still have much to do, and the full benefits from the announced initiatives are going to take time to materialize," Chief Executive Muhtar Kent said on a conference call. Coca-Cola's net income attributable to shareholders fell to $1.56 billion, or 35 cents per share, in the quarter, from $1.63 billion, or 36 cents per share, a year earlier. Excluding items, it earned 48 cents per share in its fiscal first quarter ended April 3. Net operating revenue rose 1.3 percent to $10.71 billion. A strong dollar partly offset higher volumes and prices. Consumers bought more teas, dairy and water, but fewer juice drinks. Coke said the dollar will remain a headwind for the balance of 2015. Analysts, on average, expected earnings of 42 cents per share on revenue of $10.66 billion, according to Thomson Reuters I/B/E/S. The company benefited from six additional selling days and the timing of Easter. Net operating revenue in North America, its biggest market, rose 6 percent to $5.10 billion. Revenue excluding acquisitions, divestitures, and currency impact, increased 10 percent, helped by higher concentrate sales and prices, which rose 2 percent.